Productive meetings don’t just happen – they are planned. Learn the 7 secrets to running a great meeting. I recently met a young engineer with an exciting job where he gets to travel to remote villages all over Alaska. He was telling me about the challenge of being in the office – meetings. I shared with him my standards for meetings – and thought it might be a good idea to share them on my blog as well. The person who organizes the meeting needs to spend five times the duration of the meeting organizing the meeting. For example, if the meeting is an hour long, the person who called the meeting needs to spend five hours organizing the meeting. Meetings are very important events and they take up people’s time. In the “real world” time is in fact money as people get paid for their time at work. Meetings have a very real cost associated with them. A well organized meeting is worth it’s weight in gold. Everyone coming to the meeting needs to spend as much time preparing for the meeting as the duration of the meeting. Making sure people are ready to fully participate in the meeting is crucial for an effective meeting. 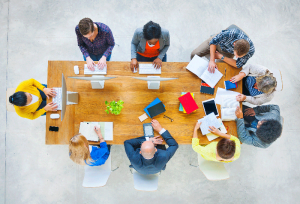 Meetings are social events – even virtual meetings. Many of us spend our days working in solitude behind our computer screens so when we have a chance to interact with our project teammates it’s a chance to catch up and socialize. Ignoring this very human need to connect makes sure this requirement for socializing derails a tightly planned meeting. For an in person meeting lasting longer than fifteen minutes, I start with serving a healthy snack and factor in five to ten minutes for connecting. For virtual meetings of any duration, I allow for the first five minutes as a catch up with the meeting participants sharing any personal news they would like to share. As part of the meeting planning process, we fill out a meeting prep sheet for the meeting. This lists who needs to attend the meeting, their contact information, and their purpose for being at the meeting. We make sure who we need at the meeting is at the meeting and who we do not need at the meeting finds a more productive use of their time. In the meeting prep sheet, we identify the specific goals of the meeting and who needs to share what to achieve each specific goal. We assign a time and duration for each goal in the meeting. Most meetings I run require some type of interactive element – whether it’s a visual aid, or some type of consensus or clarity building activity. We make sure as part of the prep process we have whatever it is we need during the meeting. We document all agreements and initial them to make sure everyone is on the same page with what we decided. You can learn how to run more effective meetings in Cheetah’s Project Accelerator Course – offered both online and in a very engaging one-day classroom format. Click here to learn more. If you’d like to get a free copy of the Making Meetings Matter checklist – visit www.cheetahsmartstart.com. This entry was posted on Wednesday, February 24th, 2016 at 10:18 am	and is filed under High Performing Business. You can follow any responses to this entry through the RSS 2.0 feed. Both comments and pings are currently closed.